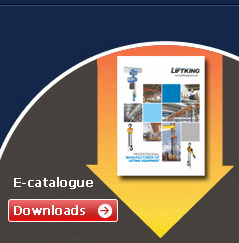 Wire rope puller is a new, high efficiency, safe and durable lifting equipment. It has three function of lifting, pulling, tensioning, beautiful appearance, reasonable structure, with a high breaking force and wear-resistance features. LIFTKING brand wire rope puller use alloy aluminum shell, long service life, light weight, portable and easy to operate. The mating wire rope with high breaking force and wear -resistance features. Our wire rope block lifting capacity is from 0.8 ton to 5.4 ton, and the pulling capacity is from 1.3 ton to 10 ton. 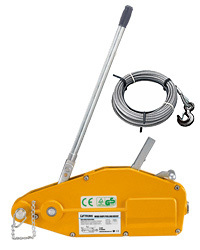 The compact design of this puller increases its portability without hampering its strength. Designed for heavy-duty pulling, rigging, dragging, stretching, and lifting applications. Limitless wire rope travel allows use over great distances, and the large surface area of the dual-clamping jaws provides an evenly distributed grip on the wire rope for smooth operation and low wear. 2. Equipped with two safety devices, and this guarantees safe operations. 4. Wire rope can be used at any working temperature degrees. 5. Equipped with a safety hook, preventing wire rope from coming off while operation. 6. Most rationally peaned, designed and durable.